Neo breaks club records in 50 and 100 back. 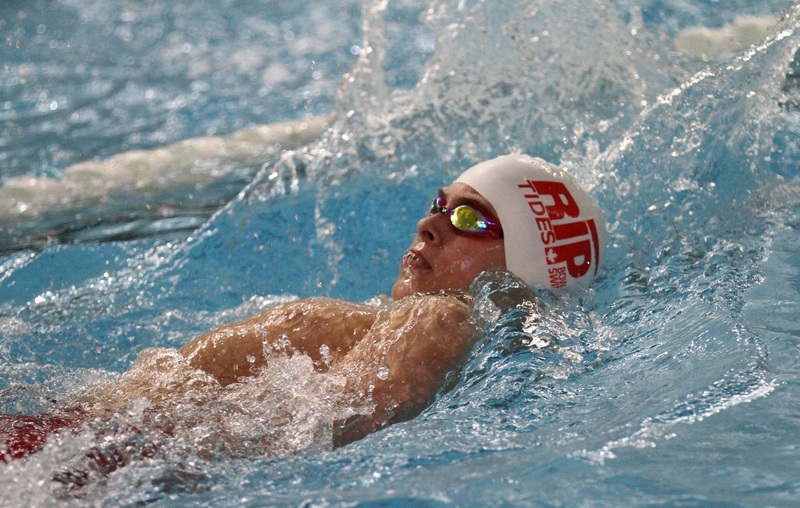 Twenty-one Riptides competed in the Cascade Age Group Challenge, the first big meet of the season. The three day event in Calgary had heats in the morning and finals at night, with medals awarded to the top three finishers. In a grueling schedule, Neo swam 15 races, broke 4 club records, won 4 medals, achieved A times in all his races and qualified for the Alberta Age Group Provincial Championships in March. His 50 and 100 back times eclipsed five year old records set by Simon Cuell, while his 100 free and 50 fly times broke records set by Jason Evans in 2007. He took home 1 gold and 3 bronze, and finished in the top 7 in his other events. Congrats to Avery, Alex, and Sean, who qualified for the Alberta Age Group Trials, with swims in the 400 free. Alex swam personal bests in all seven of his races and achieved B times in the 50 free and 50 fly. Sean took close to two minutes off to get his first B time in the 1500 free. Avery qualified by dropping 2 minutes off her previous personal best in the 400 free. More details to come in the coach’s report. This entry was posted in Meet Results and tagged Records by bowvalleyriptides. Bookmark the permalink.